​is the third and last in a series of three inspiring Kontakt 5 instruments, the so called ‘ Blue Orb Series ’. 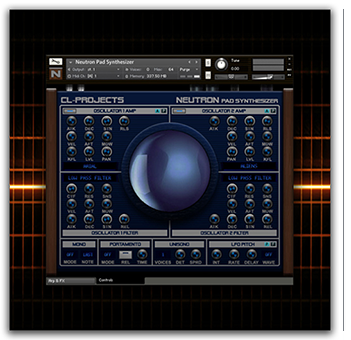 Neutron is a dual oscillator synthesizer intended to make atmospheric and lush pad sounds. Neutron has a dual oscillator architecture with multiple envelopes, filters, LFO's and effects .But don’t be fooled by it’s name. Also bass, synths, strings and other types of sounds are possible with this versatile synthesizer. ​can be modulated via Velocity, Aftertouch, Key Follow and the Modulation wheel. And to top this all off, you have a choice between 8 different FX (Digital Reverb, Digital Delay, Chorus, Flanger, Phaser, Compressor, 2-Band EQ, Skreamer distortion) and an Arpeggiator. with an integrated arp pattern generator. ​already comes with a big selection of sounds for you to play with (200 instruments and 76 multis) of which 140 are pad sounds and 32 are ambient and FX sounds. The sounds of Neutron are highly inspirational and are therefore very suitable to translate your musical ideas into complete tracks. The big amount of controls encourages you to make your own sounds The possibillities are endless. Be ready to enter the world of Neutron. You won't regret it. ​"Got another product from CL-Projects to show you, this one is dedicated to pads and atmospheres. It’s the Neutron Pad Synthesizer for Kontakt. Let’s check it! So what is the Neutron Pad Synthesizer? It’s a Kontakt instruments dedicated to being a powerful pad synthesizer. It’s a dual layer, or dual oscillator synth with plenty of knobs and control over the sound. You can mix and match different sound sources using the 2 oscillators, and even activate the arp to add movement. Of course it has an lfo, amp and pitch envelopes, filter, filter envelopes, and fx, pretty much everything you need to tweak your sound. How does it sound? Well, as you’d expect, there’s some very lush pads and atmospheres in here, but what you may NOT expect, is the other sounds you get. In addition to the pads, there’s brass, strings, leads, synths, and even a few bass sounds. The point is, while this instrument and it’s presets were geared towards pad sounds, you can really get many different types of synth sounds thanks to the flexible interface. I didn’t find any issues with the recording quality or samples, and though some of the sounds may have had a bit too much release or reverb for my taste, that is nothing more than a quick knob turn away. Overall there’s definitely some good sounds to be had. So what’s the bottom line? Sometimes the very thing you need to inspire or spark your creativity is a collection of new sounds. Thankfully there are indy developers out there making great instruments that don’t have to break the bank, making quality content available to anyone no matter the budget. I give the Neutron Pad Synthesizer 4 out of 5 subs, it’s a straight forward instrument that delivers exactly what’s promised, and a little bit more. I like the inclusion of the “other” sounds, I think it just makes the instrument even more versatile and useful. In the end, there were definitely some great pads and atmospheric type sounds as expected, but I also found some really nice lead and string instruments too. Definitely something to check out if you’re in the market for some new instruments, just make sure you’re using the full version of Kontakt, as this is not a player library." Mark Taylor: "HIGHLY RECOMMENDED - INSPIRATIONAL SOUNDSLike TRIODE and SAFFRON, this final installment in the BLUE ORB TRILOGY of synths is a fantastic bargain! Excellent selection of warm, smooth pads + plenty of other strong sounds as well...leads, FX, ambiences etc. Everything is very well programmed and put together with great attention to detail. CPU use is very good so far. GUI is intuitive...creating your own sounds is straightforward and lots of fun." Wil Harris: "EXCELLENT! This is an excellent library!! I love it!" to edit. ​Tomislav Erhard-Pacovski: "REMINISCENCE OF THE INSPIRING PRESETS OF YESTERYEAR. This is my latest purchase from CL-Projects. This developer is in my opinion, one of the best ones in the field of recreating the sounds and presets from the legendary digital keyboards, such as Roland D50 and Korg M1. Although I was still a child when these were released, many new age, ambient and cinematic artists from the 80's and 90's, whose music often inspire my own work, have used similar sounds in their compositions. Because my CD collection is full of instrumental synth music, I know many of such sounds intimately and the products from CL-Projects make them a part of my, now quite substantial Kontakt library collection. Neutron is a library of presets, some which sounds quite similar, but I gather that real strength of this Kontakt instrument lies in the possibility to build your own presets, using the included sound sources and the hailed A-B structure and workflow. The built-in effect section is equally important and the effects are decent, however they occasionally suffer from slight glitches and pops, especially when being tweaked in real-time. But all and all, this is a good investment if you are into inspiring presets of the yesteryear. You may also want to pair this library with Pad Factory Bundle from the same developer, for even more sonic options." Serge Golikov: "NEUTRON. This is Pad Heaven! I love this instrument, I am old enough to remember drooling over synths and workstations such as the D50 and M1 back in the day when few music enthusiasts could afford them. Lush is the understatement to describe the pristine sounds this instrument produces from the expertly crafted patches using the pure sounding 24bit wav samples. The string sounds alone, hold their own when pitched against dedicated Orchestral libraries costing hundreds of dollars more. This is a real gem!" Josh Vinci: "FANTASTIC. Beautiful, inspiring retro 80s-90s synth sounds - focused on pads, but also some great leads, arps/sequencers, and effects. Just another great delivery from CL-Projects." ​​Fabrice: "Huge. The best Kontakt library for Pad ever produced. A must for producer, sound designer and even as me just music makers for fun. Love the CL-Projects libraries. Try it is love it "
Reginald C.: "​inspiring pads. The pads are inspiring with multiple variations. Sound quality is great and the Neutron Pad Synthesizer is good tor any genre."